The Centennial Entertainment Center is the perfect fit for your home theater, living room or den. Popular for more than a century, the Mission furniture style owes its origins to simplistic, but alluring furniture made in California missions in the late 19th Century. To honor the enduring popularity of Mission furniture, Brandenberry presents the Centennial Three Door Entertainment Center. The unit features a straight-angled design and simple panels. And the builders gave it a rich wood finish and black diamond hardware. Yet, this understated style displays a timeless appeal. So how does Brandenberry integrate Mission elements into this entertainment center? The builders created recessed panels on the doors, drawers and sides. So notice also the simplistic black hardware. Plus the use of mullions in the large glass door. But this is where the traditional look stops and modern-day, user-friendly features begin. For example, the doors come with concealed hinges. And behind the large glass door, the builders installed five adjustable shelves. They’re ideal for stereo and other electronic equipment. The bi-fold doors open to reveal a large space for a big-screen TV. Plus, the builders can install a DVD component area above the TV. When open, the bi-fold doors retract to both sides of the TV. Also, Brandenberry can furnish the entertainment center without the bi-fold doors. And this option frees up even more TV space. The four drawers provide room for DVDs, CDs and more. Plus, the drawers open full-extension. And this gives users the ability to easily access the entire drawer. Also, the drawers’ dovetail joints enhance their strength. 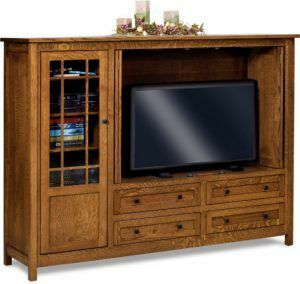 No entertainment center merges Mission furniture with today’s electronic gear like the Centennial Three Door Entertainment Center. Lovers of custom-made furniture know the value of seeing, touching, smelling – and experiencing – the furniture for themselves. That’s why you need to visit Brandenberry Amish Furniture in Shipshewana, Indiana. And among the many experiences Shipshewana has to offer – like Amish farms, Amish food and flea markets – the most solid is your visit to Brandenberry Amish Furniture.